Formerly known as The Inner Circle Of Bizarre Magic Gathering. DATE HELD: November, 12th., 13th., 14th., 2015. This year's ICBM/The Gathering in New England was wonderful! There were almost 70 of us present and what a great mix of magic and bizarre. Two of the guest lecturers - Geoff Williams and David Corsaro -both went out of their way to present some of their GREAT material with a bizarre twist; very much appreciated by many. I opened the lectures with a presentation and discussion on The Theatrical Seance. Lots of discussion followed with almost another hour up in the hospitality suite! Comments heard were "helpful; sensitive; moving; strong routine; good use of the pendulum; good use of the centre tear; good solutions to some problem places; etc." Leslie Melville hosted two late-night sessions of dark, and humorous, tales in the hospitality suite with a nice variety of attendees presenting. I have to admit that I have heard a few orations of the Cremation of Sam Magee, over the years, but never such a presentation as given by Lee Woodside (?). The man's voice, clear recitation and southern accent made it the most moving and best understood version I have ever heard! The lecture by David Corsaro was oneI wish I had heard 30 years ago. A brilliant lecture on marketing with strong examples by using magic. THIS IS a lecture every club should be bringing in! A young man who is up to date and knows his business because that IS his business! Geoff Williams was hilarious presenting good magic and showing strong and respectful control of assistants while on his stage. I have to say that his cut and restored rope/knots over the head was one of the most entertaining things I have seen in years! Jimmy C was a class act. Nothing new to see but his magic was clean, well presented, entertaining and he himself was always a gentleman and always willing to discuss, show or help. He was quite remarkable seeing as how he had a very late start in magic. A professional all the way. And I would be remiss not to mention our gracious host - Mr. Joe Cabral! He went out of his way to make sure that everyone was enjoying themselves, even in the midst of two fairly large political 'disruptions' that most of us did not see or feel! THAT is the mark of a real professional - putting personal feelings aside for the good of the whole. I was really impressed with his hospitality, graciousness, availability and excellent organization of this wonderful event. I can only begin to imagine what the 25th anniversary of this event will be like; AND THAT'S NEXT YEAR! Be sure to book it ASAP! A few random and early thoughts following my return from one of the most enjoyable gatherings Adrian and I have attended. There seemed to be an influx of 'Newbies' this year, always a good and healthy sign that the event, after a continuous and unbroken twenty four years, can still attract. respectively, David Cosaro and Geoff Williams, " both technically mainstream performers but intelligent and astute enough to realise that this is essentially a 'Bizarre Magick' event and professional enough to adjust their material accordingly. psychic/spirit parties in people's homes and also presents spooky story ghost walks. His lecture and subsequent Saturday Gala performance were full of charm and style. For their participation in William Warlock's midnight, 'Appointment with Fear!' event, I would personally like to thank David Mousch, Gil Earl, Lee Woodside, EvilDan Terelmes, Tom Smith, Mary Tomich, Odes Ohdner and Daniel Greenwolf. The camaraderie was, as always of the very best and to see Scott Payne in his various incarnations is always a delight! Great to see Craig and Joanne Dickson (my sincere apologies again for you know why!) and Blackpool knowledgeable fanatic, Thom Dunlap. And Joe Cabral, the Grand Magus himself on top form, bustling around and making sure everything was as it should be. Now that I'm back home in Oklahoma City and have had plenty of time to collect my thoughts, I figured that some of you on the Shadow Network might be interested in a first-timer's take on the Gathering of the Inner Circle of Bizarre Magick held in Southbury, Connecticut November 12-14th. I'll get my complaints out of the way first thing: a noisy heating unit and low water pressure in the hotel room and slooow service at the banquet. Just minor annoyances, really. I want to thank Rich Lavengood for taking the time to pick me up at the airport Thursday and drop me back off on Sunday. It was much more pleasant than having to drive in a strange place. Also, being able to visit with him and Rick Mayers during the drive was very enjoyable. "Bizarre Magick 101" was a great way to kick things off at 10:00 pm Thursday evening. Thanks to Odes Ohdner and Evil Dan for a spirited presentation. Although it was not bizarre, Jimmy C's lecture was very enjoyable. His enthusiasm for magic was contagious. He also offered lots of tips, ideas and one-liners that were worthwhile for the beginner or the seasoned performer. The "Works in Progress" was a great place for folks to show their routines. I was somewhat hesitant to perform but decided to try my "Aunt Clara's Prediction." I'm glad that I did. I received a great reaction and performing definitely helps people learn who you are. I encourage everyone who goes to next year's convention to work something up to perform. I very much enjoyed watching the other performers' routines. Lothar Malmberg presented a great low-light séance and lecture. I have studied séances for many years, but had not yet had the pleasure of actually seeing one performed so it was quite a treat. He had some wonderful effects and a great many practical ideas. The Friday evening show was a lot of fun. I have read about the antics of Wabu Djambes and Dr. Mombo on the Shadow Digest for many years but finally got to see them "in the flesh." Jimmy C's "vent" bit with Joe Cabral was hilarious and the "Death of Penn and Teller" was great. I had corresponded with Evil Dan and seen him and Colleen on Jay Leno but it was a real treat to see them on stage in person. I feel like I'm leaving someone out and if so I apologize. The Saturday morning close-up show was a mixture of bizarre and "standard" magic with many very strong routines. I thought that Daniel Greenwolf's story about the dying little girl whose dad carved and painted wooden hearts for her was very moving. David Corsaro presented a lecture of very strong commercial magic routines. He's a young man and his professionalism and people skills tell me that he is going to go far in the world of magic. Charlie Hayden showed some classics of magic including the flaming wallet bottle production sponge balls and coin in bottle. His strong personality lets him pull of treating his audience members in a way that few people would be able to get away with. I know that I couldn't do it but it seems to work for him. Geoff Williams is another rising star of magic and he presented us with a great lecture. He showed us some great routines and also offered practical advice, such as a better way to handle the "Invisible Deck." He very graciously offered to send us the directions for his powerful "Devastation" card trick via email. The banquet was great with the exception of the somewhat slow service that was mentioned at the first. There were lots of fascinating magicians to visit with while awaiting the food. One person remarked that the banquet reminded him of a costume party and when I looked around the room I saw what he meant. It was a fun atmosphere. I did not take any notes during the Saturday night show. I just sat back and enjoyed it. Lots of good magic! 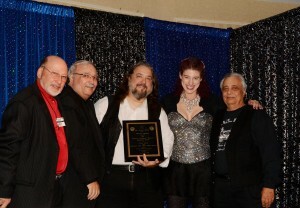 I've been to an IBM convention and a few of the TAOM (Texas Association of Magicians) conventions and they were good but they tend to have too many people. This convention reminded me more of the ones that Bill Pitts (Past President of IBM) used to sponsor in Eureka Spring Arkansas. With about 75 people you can actually meet people. It is more like a family atmosphere. Also the close-up shows are much better when you don't have an audience of 400 or 500! I enjoyed the fact that we had enough free time during the day to session with fellow magicians. I very much enjoyed sessioning with Professor Rem and with Rick Mayers. Both showed me some new effects and Professor Rem had lots of gags puzzles quizzes and other interesting things. I've tried to contact him to see if he offers any of his courses online such as "Suicide and Your Health" or "Tax Shelters for the Indigent." I've saved the best for last. I thought the hospitality suite was wonderful. It was a great way to relax enjoy good food and drink and to visit with people many of whom I have communicated with on the Shadow Digest for many years. In addition I got to meet many new friends. The icing on the cake was the chance to enjoy bizarre magick in a parlor setting hosted by none other than Leslie Melville who traveled all the way from Great Britain to be with us. The routines were wonderful. I was a bit reluctant to recite "The Cremation of Sam McGee" because it wasn't an actual routine only a poem. The reaction from the audience told me that I should not have worried. I thank Lothar Malmberg for his very kind words regarding my recitation of the poem. I thought it interesting that he mentioned my southern accent. Heck I thought I was the only one there who didn't have an accent! I found it fascinating that both Leslie and Lothar had connections to the poem. Leslie once resided in a town in Scotland that Robert William Service had lived in and Lothar lives very close to the grave of the actual Sam McGee! I can't sign off without commenting on the welcome packet. Lots of goodies were contained in it. I do have a question about one item. It looked sort of like a two-sided leather coin purse except that it's flat. Can anyone tell me what it is? Special thanks to Karl Bartoni and Greg Solomon for the CD with the past 20 years of Ed Solomon's Christmas music. What a nice treat! I even learned something new ordering breakfast one morning. I ordered a breakfast sandwich at Patty's Pantry next door to the hotel and they asked if I wanted it on a grinder. I said "I'm from Oklahoma. What the heck is a grinder?" In conclusion I truly enjoyed the Gathering and would highly recommend it. I hope that I am able to attend the 25th Gathering in 2016. If so I hope to see you there. Many thanks Lee for such an in depth review of the 24th ICBM Gathering. When I used to organise the Edinburgh Gatherings I found that those who attended returned home with totally different perspectives of their time at the event which I liked to know about and so it was good to read your review, as a first timer attending the ICBM Gathering. Thank you for your 'special thanks' re. the Ed Solomon CD (given out in remembrance of our dearly departed Ed Solomon). After thinking it would be nice for attendees to remember Ed in this way, I contacted his son Greg for permission before having a studio make the copies for me. Greg was only too pleased to have me go ahead and in actual fact asked for a copy as he hadn't got a copy. With reference to Lee Woodside's remarks, it was good to get the thought's of someone attending for the first time. There did seem to be a healthy mix of new/regular attendees which gave the event freshness. This was my ninth attendance and my son Adrian's fourth. He said it was the most enjoyable one he had experienced and I felt there was more of a 'buzz' than in the last year or so. With regard to the Midnight shows in the Hospitality Suite. They came about as a result of my 'Jack the Ripper' presentation in 2014. I was scheduled to perform in the main hall on Thursday evening. It meant that the early Thursday arrivals, already ensconced in the Hospitality Suite were obliged to leave the comfort of their easy chairs to go downstairs and sit the formally arranged rows of hard seats to watch me for forty minutes before returning to the relaxing warmth of the Hospitality Suite! It occurred to me at the time that I could easily have performed the piece in the informal 'parlour' setting where it might perhaps have been more suitable. I later suggested to Joe that performances could take place there that would permit the presentation of material that might be unsuitable or inappropriate anywhere else. It would also create an opportunity for some of the regular attending members who we don't often see performing (Mary Tomich for instance!) to remind us of what they can do! Joe agreed and the result was William Warlock's Appointment with Fear! I am already planning next year's production!